Is Expected Monetary Value (EVM) Enough when Evaluating the Impact of Risk? From this, we are taught to develop rating systems to categorize risks so we can prioritize the effort and funding in developing mitigation and response plans. We cannot detect it early enough and/or We cannot respond to it fast & effective enough. So why don’t we put these factors in our risk planning? To effective deal with a risk event you need to detect its happening early enough, you need to communicate the event with all impacted parties, and you need to muster for resource and respond. To assess this I propose adding the concept of REACTION INDEX. 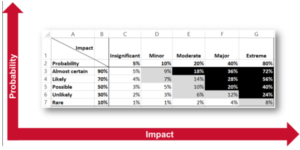 Once we know how effective we can react we can update the conventional probability and impact matrix (above) with a new tool, the Risk Index. This new tool allows us to rationally assess the full risk situation. In some cases, more moderate EMV situation can be made much more severe because of weaknesses in our ability to detect or communicate or react. Sometimes, we may feel these cases are “no big deal” because they are easy to handle. Sure they are, if you detect them. In our personal lives, have you ever found a mess in the basement from a leak in the hot water heater? It easy to limit the damage, when it starts to leak just turn off the water and call the plumber. So why do we get a mess. Because most times we don’t detect it soon enough. Supply Chain disasters are the same. Have you ever had to stop a production line because a shipment didn’t arrive on time? I have. Why? Our detection mechanism was an empty receiving dock. Truthful but not useful in a preventative sense. Why didn’t you have an ASN? Great question. Do you get ASN’s from every supplier? I don’t think anyone does. A topic for another SCC. I use these examples to illustrate my point, A reaction Index needs to be added into your risk management thinking because plans alone are not enough, action is what mitigates risk events. 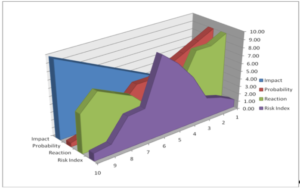 Adding Reaction Index thinking into your supply chain management risk process also helps us from better mitigation plans because asking the questions necessary to determine the Reaction Index forces us to be objective in how well can we really detect, communicate and perform in a risk situation.